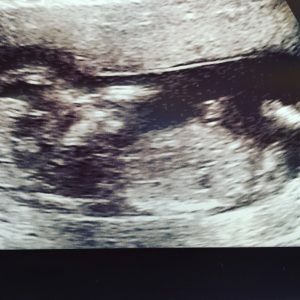 The 12 week scan. What’s all the fuss about? Why is it such a big deal? It’s just the chance to get a black-and-white photo of a blob that somewhat resembles the shape of a tiny human, isn’t it? Well, that’s what I always thought before we found out that we were having a baby. How wrong I was. I have a very understanding boss. In fact, at times she has been more excited about this pregnancy than we have been! So on the morning of the scan, I didn’t have to go into work until lunchtime and could keep myself busy with my never-ending to-do list until it was time to got to the hospital. What actually happened was that I spent the whole morning pacing around the house in an incredibly nervous state. When I’m stressed or nervous, I do strange (but useful!) things like cleaning the kitchen. Well, the kitchen bench had never been as clean as it was that morning! Eventually, the time came to go and collect Laura from work so we could go to the hospital. This is when I got the chance to imagine what it must be like to work for MI6. I couldn’t be spotted outside her work In case I gave the game away and her colleagues discovered where she was actually going (although I’m sure MI6 agents have much more interesting assignments than parking their 4×4 strategically away from an office block…). So I sat, in my incognito state, outside Starbucks just up the road. Sipping a flat white. With my name written on the cup. This incognito business wasn’t going too well. Anyway, as we drove to the hospital a short while later, you could tell that we were both nervous. When we’re nervous and when we’re eating are about the only times that we’re quiet. Now, the hospital had kindly sent us some really detailed instructions of how to get the bus there, but the bus doesn’t offer heated seats, a DAB digital radio and automatic climate control, so we took the car. However, the information about where to park was slightly vague. Cue two somewhat stressed people driving around the myriad of hospital car parks with increasing levels of cold sweat going on. Having driven the wrong way through a restricted car park where we almost collided with a hospital laundry lorry, we eventually made it to the Women’s Health department and made our way inside. ‘Please arrive with a full bladder,’ is what the leaflet from the midwife said. For my wife, this was proving to be problematic. You see, she has an overactive bladder and even a simple motorway journey is never complete without stopping at most service stations along the way! So keeping a full bladder was quite a feat for her! Very soon, the time came for us to go down to the ultrasound room. The butterflies in my stomach went into overdrive. I’d read some stories about people going for the 12 week scan and finding out that there was no heartbeat. What if this was going to happen to us? I kept thinking to myself that this should be exciting, but at that point I was terrified. The room was dark and I took the seat next to the bed where my wife was lying, with her tiny bump only just beginning to show. Or maybe it was just her full bladder. Next, the clear gel went on. Then, the sonographer began to prod my wife with her contraption. And suddenly, as if by magic, we saw our baby on the screen. Its little heartbeat was fluttering away. We saw its spine running the whole way down its body. Its arms were moving around, almost like it was waving to us. 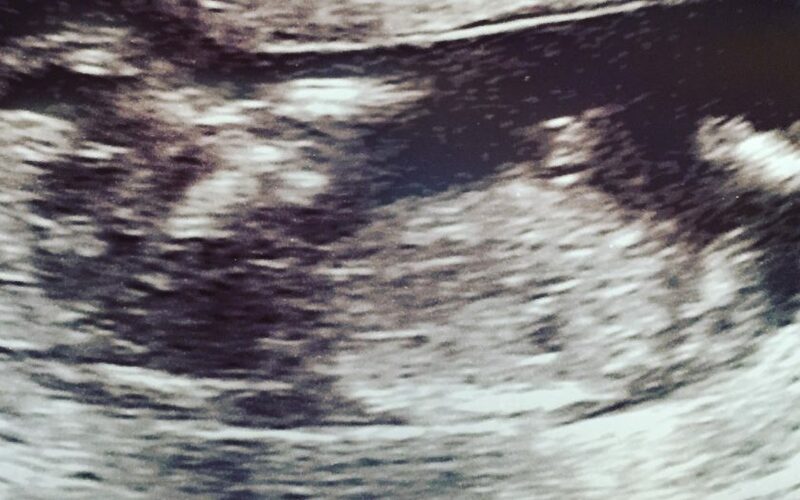 Our baby was saying hello. Our baby that we made. Our baby that was cooking away inside my absolute hero. I think that’s the point where I began to well up. I’ve always been a bit of a crier and this moment was no exception. I just sat there, holding hands with the love of my life as our baby waved at us. It even beats the experience of having my first Five Guys burger. This post was first published as a guest post on the fantastic Cailyn’s Mummy blog.